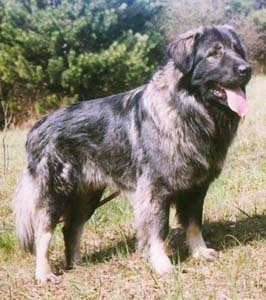 Illyrian Sheepdog is better known as Saplaninac and may also be referred to as Yugoslav Shepherd or Illyrian Shepherd Dog. It is an old guarding breed having emerged in Serbia and Macedonia. Until 1970 export of this breed was banned and hence they are not well known in other parts of the world other than their native country. Even in United States they are very rare and not easily obtainable. Even though, it is a medium size breed but it shows exceptional strength and is thus considered to be a fierce dog. They are powerful, strong, agile and brave. This breed is not a suitable family pet because they do not trust anyone, and their life revolves around their animals and property only. Thus, they make an excellent guard dogs. They may get along with mature children but in general they do not give attention to them. Grooming may take some time as it needs to be brushed regularly in order to remove dead hair and debris, but on the other hand, it needs to be bathed only when necessary. Training them is a waste of time because they are defiant and intelligent and thus do not pay heed to commands. No known disease is associated with this breed because of its rarity. It has a life expectancy of 11-13 years.